You work hard to provide for your family and yourself. You hope that your efforts will help you to lead a full and quality life. What do you do when living costs go higher then? Perhaps you’re inclined to way that you just simply work harder to go up the corporate ladder or take up another job on the side so you earn more. While this idea may be sensible and effective enough, it’s not the only way. You have to be smart about your income and expenses. How? By finding other ways to reduce your costs and trim down your needs so that your money has more spending power. Where should you begin? It all starts in your home – because it’s where much of your money goes. You pay the bills, property tax, and maintenance costs. You also have the groceries to contend with, among other things. Start with those having heating or cooling functions as these consume the most electricity or gas. Changing even just the refrigerator creates a considerable impact on your electric bill. Gradually replace other appliances with those that use fewer resources. Are there cracks or empty spaces in your ceilings and walls? Have them sealed and filled in with material that can keep the chill or the heat out. Consider upgrading your windows to double-glazed ones. Or, have roller shutters installed to insulate your residence better. Having tall vegetation near your home helps ease the effects of the elements on your house. Plant them at the side that gets the most warm air or radiation. Consider installing photovoltaic panels that can gather enough energy to heat your water. You may get a good windfall from this type of project, thanks to the rebates the Australian Government grants to homes having solar panels. The warm yellow glow given off by incandescent bulbs come at a higher cost. Why not shift to compact fluorescent lamps (CFL) that last longer and use up only about a quarter of the energy that the traditional type of lighting uses? You spend less replacing CFLs and you also pay less for their electric consumption. Get a programmable type that comes with a timer so that you won’t have to worry about turning your heater on or off at the most optimal times. Make your cooling appliance work more efficiently by regularly cleaning it. This way, the device will not have to work twice as hard (and use up more energy) in producing the cool air you need on hot summer days. You can also install outdoor living areas such as patios, verandahs, or gazebos where you can lounge about when you need to cool off. With this, you can forego using your air conditioner and save even more money this way. If you need help in deciding how you can improve your home even more, contact Strong Life – an Australian company that has a proven home improvement track record and experience in installing roofed residential extensions. Get a FREE Consultation and Quote today by dialing 03 9310 4455 or sending your enquiry through info@stronglifepatiosandcarports.com.au. Outdoor living areas wonderfully extend your floor space by a couple of metres, giving you additional venues for playing, working, relaxing, and entertaining friends and family. For this reason, many homeowners decide to have one in their own house. The fact that it helps upgrade residential property reselling value is a welcome “side effect” of such a home improvement. It’s important to ask this question: What purpose will your deck serve? If you think this is too mundane a query, think again. You don’t just think of one use for this home addition. You have to determine its main use, as well as its secondary purposes. Knowing how exactly you will be using your decks will help you know which design best suits your outdoor annex. There are those made of wood, metal, and plastic. And then there are the composites, which are a combination of timber and plastic. Check out all options and pick the one that satisfies your domestic and personal requirements. Pick those made of oak, cedar, ipe, or cypress if you like long-lasting material that ages well. Choose metal if you want a maintenance-free and practical option. Select composites if you want the look of wood and the fuss-free attribute of synthetic components. This includes the shape, colour, and size of the deck. All three should be based on the appearance of your own house. Consider also the available lawn space you have. For example, if your façade is of a contemporary design, with straight lines and a minimalist look, go for a linear deck and avoid the curved ones. It should not be obvious that your decking is a later installation. It should be incorporated to the residential design in a seamless and natural way. Which part of your home is best for this outdoor extension? What type of terrain do you have? How is your climate? Do you get a lot of strong winds, snow, and rain? If you’re living in a place like Melbourne, where the weather fluctuates quite unpredictably during the day, you should use material that handle the effects of these climate changes well. Consider a design that allows you to easily convert your deck into a closed space from an open one. Include maintenance expenses in the computation. Some types of decking, such as those made of certain types of wood, need more maintaining than others. Make sure you have this aspect covered so that you won’t run into unexpected cash outs that may put your finances out of balance. Your Melbourne home will need decking installed with a roof, considering the unpredictable weather. Choose the kind of roofing that can be easily opened when you need more sun and breeze and closed when the climate takes a harsher turn. Strong Life Australia has a wide selection of roofing suitable for outdoor living areas such as pergolas, patios, and verandahs. Call 03 9310 4455 now to get a FREE Quote! The trend of matching shades of contrasting or similar hues began roaring again in 2011. This started in the 60s or 70s, when Andy Warhol and his pop art movement came to full flower. Today, this style has continued to flourish and be in vogue. What’s really appealing about it is that it uses bright shades and can be used in a variety of settings, such as the home. Applying the basic principles of colour blocking into your interiors and exteriors brightens up your house and makes it appear more vibrant. You don’t even need to use expensive materials – the key element here is the use of hues and how you mix and match them. Basically, there are three ways of applying the said colour scheme to your residence. One is using the same hue but in different shades – a technique called “monochromatic.” An example of this would be decorating your room in varying intensities of green. Perhaps your couch will have a deep emerald covering while its throw pillows take on an apple green tint. The curtains can be in jade, while the carpet will be moss-colored. Another way is by mixing contrasting hues. Let’s use the living area as an example again. If your couch is deep emerald, its throw pillows should be orange instead of apple green. The curtains may be red while the carpet, or perhaps an area rug, may be changed to blue. The colour variety should not go beyond 4 and should all be complementary to each other. Otherwise, the whole palette will look too much like those in children’s play rooms. A third variant is the analogous scheme. Here, you use hues that are beside each other when seen on the colour wheel. So now, while your couch takes on the grassy shade, your throw pillows can either be blue or light green. Your curtains can also be either of the 2 aforementioned hues. You can play with the combinations yourself, as long as it’s within the analogous range. You can use dinnerware in complementary or monochromatic shades to add more energy and spice to your dining experience. Or you can get those in a certain colour and pair these with chairs of complementary or analogous hues. In your garden, you can grow flowering plants of contrasting or monochromatic shades or add ornaments in vibrant colours. Your neighbours and passers-by will surely note the fantastic interplay of colours and compliment you on your efforts. With your outdoor structures, such as patios, verandahs, gazebos, and pergolas, adorn them with colour blocked furnishings to make them more welcoming and fun place to lounge in. For added interest, you can install floor tiles in monochromatic or complementary shades. Keep your roof in a neutral colour to anchor the whole look and keep it chic and classy. If you are still planning to improve your current patio, veranda, or pergola, consider a roofing design that is streamlined and has straight lines so it will be suitable for colour blocking. Strong Life has a wide variety of patio roofs that can suit different types of facades and home designs. To get a FREE Consultation and Quote on their products, simply dial 03 9310 4455 or send your enquiry through a quick form here. You’ve joined the increasing number of workers who choose to operate from the comfort of their own home. Indeed, such a set-up gives you a number of benefits, among them a more flexible schedule and effective management of work-life balance. Of course, working from home has its own share of challenges. There will be days when it’s difficult to know when to stop and ease from the professional to the domestic. And there is also the temptation to combine both and attend to them at the same time. But if you have the right setting for your professional life, you won’t be having a hard time juggling official business with domestic concerns. With that being said, one of your first steps after deciding to work from home is to create that space for your professional or entrepreneurial ventures. One of the best areas for this is, ironically, outside your house: your garden. Separating your office from the main structure or annexing it to your house helps you create that division between the domestic and the professional. This way, you reduce distractions and enhance your productivity. Also, you get to have verdant views of your garden – a stress-melting sight for sore eyes. You also don’t feel as if you’re in a very formal environment that reminds you of your old workplace, which may sometimes get your anxiety levels up. If you are into creative work, an outdoor office will help you find more reasons to be imaginative. To get more value for your money, consider installing a patio or gazebo that you can use as a guest entertainment area when the need arises or when you are not using it for work. Think of this home improvement as an investment because adding an extension is more likely to increase the resale value of your house. Start off by determining the right area where you should put up your patio, gazebo, or verandah. It should be away from the noisier parts of the house and should also be shaded and is on level terrain. In deciding how large the outdoor structure should be, consider the size of the furniture you will be using. How many desks do you need? Will you be needing a lot of storage space? How will you arrange the necessary office equipment? You can consult a professional interior designer who can help you map out a suitable layout. The design of your patio or gazebo-style office should allow lots of light and sufficient ventilation so that you won’t have to depend on artificial illumination and air-conditioning. Consider incorporating glass walls and roofs with easy-to-adjust vents in the design. If you need help in determining the best type of shelter for your outdoor office, consult the veteran professionals of Strong Life Australia. If you call 03 9310 4455 now and enquire, you will get the answers you need… Plus a FREE Quote! If you like indulging in your horticultural tendencies without having to deal with adverse weather conditions, cultivate a select number of plants right inside your house! It’s not the only good reason for having a small garden in your house. There are many advantages to having nature grow within the four walls of your domestic paradise. One of them is that they help absorb toxic fumes that may be circulating within, purifying indoor air naturally. Another benefit is that they add appeal to your interiors, doubling as lovely, living decorations that can produce pleasant surprises (e.g. flowers) every now and then. Also, they help bring a homey, relaxed yet vibrant, and comfortable atmosphere. They can also serve as conversation pieces or points for reflection when you are in a pensive mood or need to de-stress. To get all these benefits, you do need to do your part and give what plants need to thrive in an indoor setting. One of the most important factors is space. A great solution to this is assigning an area exclusively for your potted wards. This is especially ideal if you do not wish to scatter them around your house as it may be time-consuming for you to go round different areas of your residence just to water and check on them. In addition, it will reduce safety risks if you have children or pets inside the house. If your space is limited, consider creating an extension, like a small patio, verandah, gazebo, or pergola. These outdoor additions are versatile enough to be converted into an entertainment venue when the need arises, with your plants beautifying the place. Consider the position of the sun when you decide to install one of the aforementioned home improvement options. Also, make sure that the location is not near areas in the yard known to be infested with pests. If your home extension is of a limited size, pick species that will not take up much space as they grow so that you won’t have to space them far apart. Should your patio, gazebo, verandah, or pergola be at a more shaded part of your house, select varieties that thrive in little sunlight. Also, consider whether you can make time caring for more sensitive plants. If you keep a busy schedule, select low-maintenance varieties such as those that need less sun, water, and trimming. This loves the shade and need only weekly watering. NASA has commended this variety for being one of the best plants for improving indoor air quality. This is because it eliminates benzene, trichloroethylene, and benzene – which are some of the most common volatile organic compounds. Also known as the striped dracaena, this attractive specie purifies the air by absorbing airborne toxins. This is another low-light resistant plant that can thrive even on artificial illumination. This perennial is among the easiest ones to tend and is also pest-resistant. This is a flowering type that can absorb formaldehyde and add colour to your home. Are you ready to exercise your green thumb skills? Create a roofed space for your indoor garden with the help of Strong Life Melbourne. Fill up this form now to get a FREE Quote Fast. To arrange for a FREE Consultation, call 03 9310 4455 now! You may wax poetic once you realize how practical and versatile a freestanding structure of moderate size on your property can be. Modern types now come with glass enclosures that allow some privacy and protection from the wind or other elements. If you’re looking to do a home improvement project, like adding an extension to your house so you have more space, make it a gazebo. Because it can be used in so many ways you wonder why you haven’t had one made sooner. It can make life at home more pleasant and enjoyable. It can also increase the value of your property and make your residence look more attractive. If you want a workspace that gives you much privacy and verdant views of natural landscapes, add a roofed area outside your house. Furnish it with glass partitions to allow light to enter and reduce the need to install fixtures. Or, you can make it a combination of steel and glass so it lasts longer. The unconventional yet very conducive setting will have you looking forward to each day that you spend time working in there. This satisfies the green thumb in you as your beloved plants are not entirely at the mercy of the elements. This is perfect for cultivating herbs or species that require a carefully controlled environment in order to thrive – especially when you are living in an area having a climate that is not kind to such varieties. If you are into hydro or aquaponics, a gazebo makes a fantastic setting for your horticultural pursuits. Minimise kid-induced clutter indoors by assigning your children’s “battleground” or game room somewhere outside the house: the gazebo. What’s especially appealing about this proposition is that your kids will not be constantly exposed to the heat of the sun when they play. In case it rains all of a sudden, which is not surprising in Melbourne, you don’t have to stop whatever you are doing in order to bring them inside for shelter. They can carry on playing no matter the weather and without worrying about making a huge racket. You can hold small parties or informal gatherings in your glassed-in gazebo. In the case of unexpected guests, you can accommodate them there without breaking out into a sweat as you have a place in your house that is always ready to welcome visitors. To make it more interesting, install a small library, mini bar, or a home theatre entertainment system. Is your family a team of amateur astronomers? Make your gazebo your observation point from where you take a closer look at the stars in the sky. You can make your gazebo a two-storey structure so you get a better vantage point or install special roofing that allows you to open the slats when you begin peering into your telescope. Strong Life has an array of special roofing that can make your outdoor extension a well-ventilated and shaded place. Complement your versatile gazebo with an equally versatile canopy, such as the StratCo Outback Sunroof. To get a FREE Quote on the cost of having this home improving feature installed, call Strong Life today at 03 9310 4455! The hottest home improvements last year may not be the same ones now, although there are some that never go out of mode or importance. For example, roof maintenance and repair or kitchen remodelling – both are two of the most essential and classic ones. But when it comes to outdoor home extensions and enhancements, such as verandahs, gazebos, carports, decking, pergolas, landscaping, and fencing, things are a bit more complicated. This is because whatever modifications or additions you make will be immediately seen by other people. There also are potential residential property buyers to consider if you are planning to sell your house in a couple of years or so. For these two reasons, you need to be prudent in deciding whether to install a patio, porch, or some other home improvement element in your residence. One way of helping yourself determine the most suitable additions to your house is by observing and noting the yearly outdoor residential trends. You will find a common denominator in these and can base your projections for future improvements on prevailing trends through the years. This involves decorating with small pockets of vibrant tints against a beige, grey, white, off-white, or brown background. For example, you can paint your walls in a neutral shade of your choice and use furniture cushions, throw pillows, rugs, and ornaments of a bright colour. You can use a similar scheme shown in the photo below for your patio or verandah, minus the paintings and fragile decor. You can use lights as your accents, as well as floor tiles, blinds or curtains, and ornamental plants. 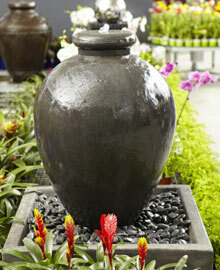 You can have a small fountain or mini-waterfall included in your exteriors. This makes the place more soothing and natural, with the sound of the flowing liquid calming your senses at the end of the long day or serving as a delightful background to relaxing conversations with your loved ones or guests. Verandahs and patios are increasingly integrated into indoor domestic elements. 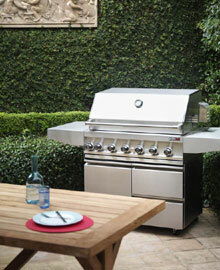 Families now dine al fresco or make their living rooms and dining areas extend outdoors. These venues are no longer just an “optional” addition but as an essential one, just as kitchens and bedrooms are necessary in a home. So, if you are planning to install a roofed gallery in your home, try and have it connected to a key area of your house, such as the kitchen, dining or living room. This allows easier integration and also gives you more room to move about in such high-traffic areas. Are you wondering about the costs of adding a roofed area in your house? End your speculation by arranging for a FREE consultation and getting a FREE Quote from Strong Life today! Enjoy the sunny climes while they last! Soon enough, the balmy Melbourne autumn weather will make way for cooler winter days, when it will be a bit too chilly to stay out for long periods. If you have plans to get together with friends or family either for a special occasion or just for old times’ sake, why don’t you entertain them outdoors? Although the preparations you need to do require less home improvement efforts, the steps you should take to make your garden or open patio a suitable place for partying are no less significant. How are your plants doing? Weed your landscaped lawn, do pest control, water your cultivated plots or potted plantings, and trim your grass, trees, and bushes a couple of days before your gathering so that you have enough time to attend to other matters. Doing your garden maintenance a bit early will leave you less worried in case this takes more time than necessary due to certain domestic complications. Are your external torches and lighting still working? Test them days before and replace faulty bulbs in time for your al fresco soiree. Don’t just attend to the ones in the place where you will hold your party – include those in your garage or carport. Don’t forget to check your pathways for holes, missing bricks or tiles, or obstructions that may be safety risks to your guests. Make sure you have all the tools and cleaning products you need before you begin to avoid time-consuming interruptions. Also, your home improvement to-do’s should be done when you start wiping, scrubbing, and sweeping your pergola, backyard, veranda, or patio. If you don’t have time to do the dirty work yourself, you can hire people who can. To save on costs, you can strike a deal with your young neighbours or relatives who can do the job suitably, although professionals are your best options in the long run. Just think of expense as an investment to making your house a more livable and welcoming place. Draw up a list of ingredients to buy based on your party menu. Include beverages, party favours, linens, utensils and plates (if you need extra), prizes for games, decorations, and cooking implements. The latter is for barbecue get-togethers where there will be a lot of grilling involved. Although most of the action will be outdoors, you cannot exclude the possibility that your guests might want to take a peek at your living room or check out your new painting or some other home décor. Also, they may have to use the bathroom and pass through certain areas of your residence, which is why it makes sense to de-clutter your interiors. You don’t need to do deep cleaning, though. Some light dusting, tidying, and wiping will do. Melbourne is known for its highly fluctuating weather. If your home exteriors are not roofed, consider installing a sunroof that can opened and closed easily via electronic control. With this kind of patio, you don’t have to worry about your guests being drenched in unexpected rain showers or bear with the punishing heat during the summer. To learn more about how you can have one at your own home, contact Strong Life now at 03 9310 4455 and get a FREE Quote. When we talk about home improvement and interior decorating, painting is one very effective way to rejuvenate your home. The use of colour can make a small space appear larger or large stark spaces appear more intimate, colour can change the entire mood of a room. If you collect a few colour swatches of your choice from the paint department, try them out in all the rooms you wish to paint because the light will be different in each room and at different times of the day. These light variations can completely alter the colour once it’s on the wall so take all this into account. A light colour painted onto the walls of a room with large windows for example will appear much lighter and brighter than the same colour painted in a room with not so much natural light coming in. A light paint colour in a neutral shade will make the room appear larger so if you live in a small apartment, choosing such a shade will brighten and enlarge the space. Another plus in choosing a neutral colour will mean your choice of furniture and furnishings such as cushions and rugs will not be limited. You may wish to add a little ambience to a room, be a little creative and add some colour or even texture, the choices of which are endless. In a room that is facing west that gets a little warm you might choose a something from the cool colour palette, pale greens and blues would work well in this situation. On the other hand if you wish to warm up a room or even just a small area like a feature wall, choosing from the opposite end of the colour spectrum will bring atmosphere and intimacy to a space. 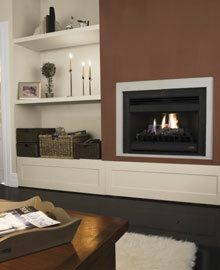 In this instance you might look at colours such as orange brown and red, these can be as bold or as subtle as you wish. The use of lighting on such colours as these can create a very special ambience and create a very inviting look, plus you get to stamp your personality within your home for all your guests to enjoy. Something else to consider could be the use of textured paint, there a many different looks you can achieve when you decide to use one of these and the paint shops have pamphlets with lots of information on how to apply these types of finishes. Usually small sample pots are available and it is a good idea to try out the colour on a small area like behind the curtain first to make sure it is exactly what you want. A textured wall can add interest in any room and the final look is only limited by your imagination so just go for it if this is what you would like. 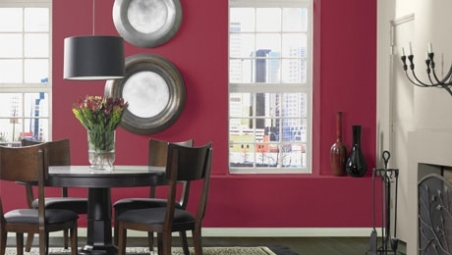 Just remember to take into account your furniture and accessories when using strong colour on any walls. Accessories such as cushions can always be changed if you so wish, but furniture usually has to last a lot longer so do take that on board. If you do grow tired of the colour eventually, it is very easy to paint over the top of it to create a whole new look again. Combine your indoor home improvements with an outdoor living solution. A fully enclosed patio with sunroof and pergola blinds makes for the perfect extension to your home. We love to be outdoors and Australians spend a lot of their spare time in their gardens so it makes good sense when planning your space from the start to consider exactly how the areas are to be used. It is the same principle when re doing an existing garden, give thought to making the space work for you. One example could be, an area where the kids can play, do they have swings etc that might take up a bit of space, how about a patch of grass for a game of cricket or similar. The plants you choose make a huge difference to design…. Give careful consideration to the plants that you choose the size they will be when fully grown, and whether they are sun or shade loving plants, do they require lots of water or are they a more hardy type? If you are not confident in choosing plants yourself most outdoor garden centres have trained staff on hand to help, alternatively the internet is a valuable source of information on this subject. Think about the area you live in, if you are by the sea and you love delicate plants and flowers you will need to provide some type of protection from salt spray. Read the labels on the pots and use this information as a guideline for what is most appropriate for your region. If you would like one particular tree to be the focul point of your garden it might be worthwhile spending a bit more on a bigger specimen to give you a head start by making the garden look more established. Theme your garden to frame your outdoor entertaining area…. It is usually easier to follow a theme for the entire garden, do you prefer a casual or more formal look? By following this theme you would possibly have plants that complement each other and the water requirements will be roughly the same. For example an Australian native garden will use less water than an ‘English’ garden with its rhododendrons and hydrangeas. The same goes for tree ferns and various palms, think about the environment they grow in naturally and then consider if you can replicate those living conditions for them. Drainage is also something to give thought to, if your land is on any type of slope think about where the runoff water will end up. A few well placed agi pipes buried in the ground could be the difference between your garden being beautiful and accessible, or a complete swampy marsh. Don’t underestimate the importance of the ‘outdoor indoor room’. By this I mean a pergola installed over your patio to provide that all essential entertaining area for adults and children alike. Maybe think about going one step further and fully enclose the patio area to create an extra room that can be utilised in all weather conditions, how great would it be to have a room in the garden where you can relax, see your lovely plants growing and not be at mercy of the searing sun or drenching rain. An added little luxury might be a sun roof installed in the roof of the pergola which can be opened up to expose those gentle cooling breezes on a very hot evening. BBQ’s are always a crowd pleaser! Cooking outside is a great pleasure for a lot of people, and a bbq is almost a necessity that can be used all year long especially if it is under some sort of cover. If you have a large family or entertain you would probably require a bigger cooking surface. Barbeques today come in various shapes and sizes, lots of them have a wok burner and warming racks, or you might be inclined to build your own and add any number of burners to it that you wish. Of course if you are eating outside, you will need somewhere to sit so comfortable furniture is important. If you have a covered in Patio the type of furniture will not be so important because it won’t be out in the weather so basically your choice is not in any way limited. If you don’t have a covered pergola then it’s a good idea to look for furniture that can be left outside in all weathers without any fear of it rusting. Most outdoor furniture stores sell removable cushions for the chairs so these can be brought inside after use to prolong their lifespan. If you have a garage or carport attached to your home these too can be used for entertaining (as long as the car is not inside)! You can make this space look a little more special by installing some decorative lighting overhead, make sure you have a couple of power points located in easy to reach spots, extra power points always come in very handy when entertaining. If there is enough room in your carport the cushions from your outdoor chairs can be stored under the roofline.